Tomorrow's News Today - Atlanta: More Restaurants, Retailers and Residences Coming to Howell Mill Road... Oh My! More Restaurants, Retailers and Residences Coming to Howell Mill Road... Oh My! Atlanta-based Healey Weatherholtz is starting work on what will become Howell Mill Shops. The plan is for a mixed use project that will combine "restaurants, shops and residences in a walkable streetscape." The project is situated along Howell Mill Road, on the front, and Emery Street on the back. The project will mean the demolition of a number of separate structures along both Howell Mill and Emery, including, but not limited to, the short lived Carizma restaurant / lounge, former Tom's Folly restaurant, as well as the Fashion Care dry cleaners. The Post Office, currently utilizing only a portion of a former Big Star grocery store, will likely relocate when the project moves forward. For now, fencing around most of the affected real estate has been put in place and demolition could begin soon. Personally, I think this will likely add to an already treacherous stretch of road where there is no room to increase either the number of lanes or their size. Jamestown has done a fine job at their Westside Urban Market, and has more development in the pipeline. Howell Mill Shops, while clearly trying to capitalize on this prime location where so many drivers pass by, is simply too much redevelopment for the area to support, either logistically or financially. Healey Weatherholtz also owns The Shops Around Lenox, a center it purchased in 2009 and pumped millions into remodeling and repositioning. Today, the center is nearly 100% leased, and includes Crate & Barrel (relocated from Lenox Square) , DEKA (relocated from Pharr Road) and Bhojanic (Second location for local Indian eatery), among others. Weatherholtz also owns the popular Paper Mill Village in East Cobb and 736 Peachtree Street which today is a parking lot, but has potential for future development. What are your thoughts on this project? Is this project too much for the area to support or will deck parking and greenscape make this a great addition to the neighborhood? If you are in favor of the project, what would you like to see open within it? Any project that has parking lots along the streets in front of the buildings is not a "walkable streetscape". Demolition is well under way, with most of the buildings already torn down to their foundations. I do agree this is more traffic for a corridor that has been over capacity for the last ten years. I am pretty sure that the Healey/Weatherholtz proposal is dead. What is being built at that site is apartments called Crescent Howell Mill. Wow is really all I can say. I have lived in this area for 4 years and have seen the area add so many businesses that it is traffic hell almost 24/7. This is not what the area needs. If anything the area should be built out slightly. North towards Collier and Chattahoochee. That is happening a bit too. The project being built at that location is called Crescent Howell Mill. Here's a link to a permit document from the city with the location. Well... Which one will it be? I called on the vacant tom folly space over a year ago and was told it would be a mixed use development available in 2014. Another faux walkable development. That rendering is just another auto oriented development that we don't need in our city. I stand corrected. It appears that Crescent Howell Mill will be the residential component of the larger development. The Crescent apartments is the building in the upper left corner of the rendering. I've lived in the area for 20 yrs now and I avoid Howell Mill like the plague. That section between 75 and Collier is impossible most times of the day and its only going to get worse. Ah, "smart growth". 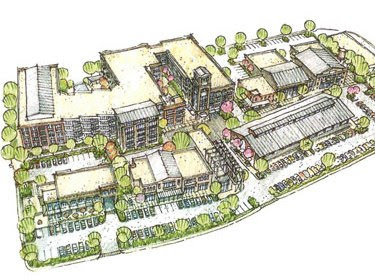 It is, in fact, a mixed use development with both retail and restaurants in addition to apts. It is a great location and will be a huge asset, functionally and aesthetically, to Berkeley Park, Loring Heights, Collier, and Underwood Hills. Now, let's get it moving!